Two decades ago, Vanessa Howard was a homeless single mother of three with only $1.75 to her name. During that time, the woman from Tampa, Florida, admits she was — at one point — suicidal. A victim of domestic violence, she had first gotten pregnant as a teen and left her "drug infested" childhood home, not sure where to go next. "I cried out one day," Howard told CBS News. "I was tired of being homeless, tired of being alone and prayed for help." The next day, Howard hopped on a city bus with her three little girls and headed to look at an apartment, hoping that this time, the landlord would take a chance on her. When she finally met the building owner, he said something she didn't expect. "He was like, 'I don't know you, but I feel like you should have this place,'" Howard described. "It was from there that I found hope and restoration. I just wanted to pay it forward." Howard got her fresh start working in local beauty salons over the years, earning enough money to care for her children. Four years ago, Howard, who's now 62, did something she never dreamed was possible: she opened her own salon. 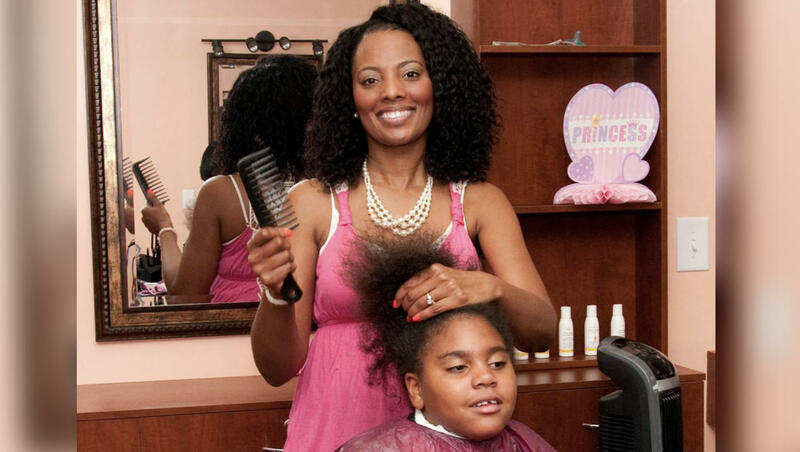 She named it the Giving Hands Hair Salon because she planned to use the studio to give back to her community. And that's exactly what she's been doing. Once a month, Howard comes into the salon on her Sunday off to give free haircuts to the homeless. "I know the struggle. That's why I give so hard," Howard said. "I'm looking to help restore women. I'm looking to help restore children, because, again, that pain is a part of my purpose." With her now five daughters by her side and a handful of volunteers, Howard gives out free trims, facials and manicures. So far, she's helped 275 women and children. "We want them to feel good about themselves," she added. "We don't want them to be concerned about how they look." Now, as the school year approaches, she's reaching out to young girls. This past Sunday, Howard once again opened her doors, spending about five hours pampering homeless girls ages 5 to 11 during what she called a "Back to School Princess Party." "We want them to feel like a princess for a day. It's important, especially during their transition," Howard said. "I want them to be confident because if they're confident they excel." The salon provided tiaras and gave the girls school supplies so they'll be ready to start fresh. They even treated their parents to free makeovers. Howard said it was worth it just to see those little girls' smiles, and she plans to continue the tradition for years to come. "I believe everything we go through we go through for purpose. I truly believe that nothing happens by coincidence," Howard said. "I would encourage other broken women, business owners — all of us have a story and I believe that we should use what we've been through to help others."